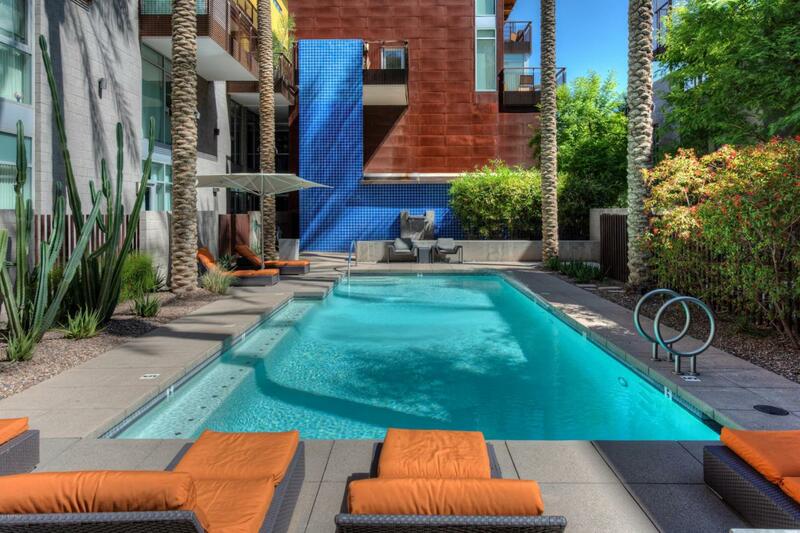 Urban luxury living in the heart of Scottsdale!! Distinctive contemporary architecture & a location with optimal walkability makes the boutique-scaled Safari Drive unique. Located on the top floor, this residence is quiet, private & light-filled with views of the Zen pool & garden below. The open floor plan includes floor-to-ceiling glass walls, concrete & hardwood flooring, plank & beamed ceilings and a custom built-in work space. The gourmet kitchen boasts top-of-the-line Scavolini cabinets, quartz counters & Bosch/Sub-zero/Fisher-Paykel appliances. Community amenities include two pools, a well-equipped gym, concierge services & access to the canal for miles of exercise. Scottsdale Fashion Square, downtown Scottsdale, numerous restaurants & nightlife are within close walking distance.